Breezy with sun and clouds this afternoon. 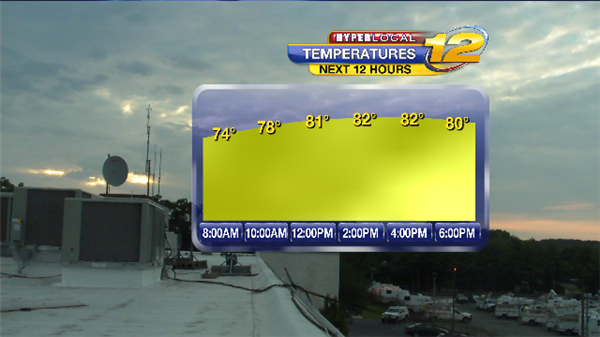 Less humid with highs near 78 degrees. Showers are ending this morning. 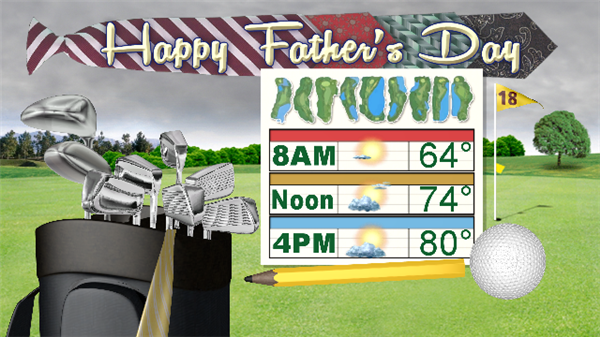 This afternoon becomes partly sunny... it will still be warm and humid with highs in the low 80's. 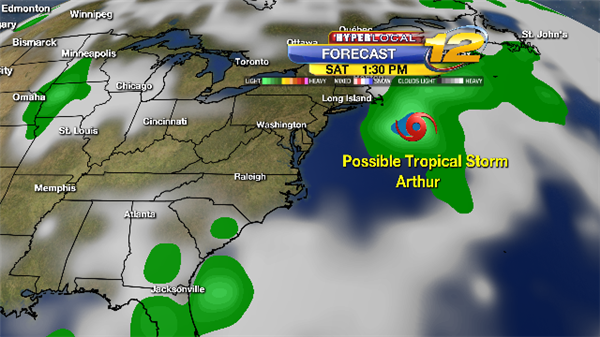 According to the National Hurricane Center: 60% chance low pressure becomes a Tropical System. 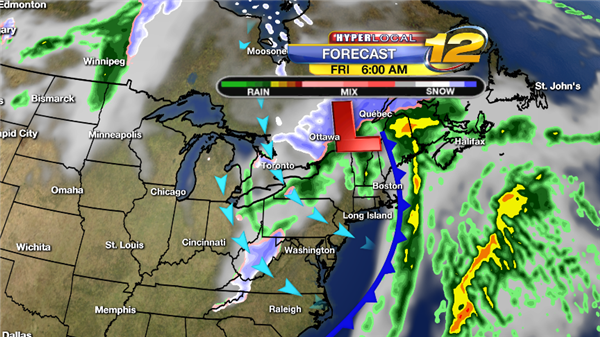 So what will happen with the storm - A cold front from the west will track across Long Island on Friday. We will have scattered showers and thunderstorms. It will be warm and humid so we could have so heavy downpours. Impacts from storm looks to be Rip Currents. Some gusty winds. WX Map for Friday 8am. Threat for some scattered showers and storms through Friday Night. Some gusty winds. Possible dangerous rip currents. Below is a look at ECMWF Computer model. 8am saturday Below- Cold front pushing storm out to sea. Drier Weather and less humid weather coming. 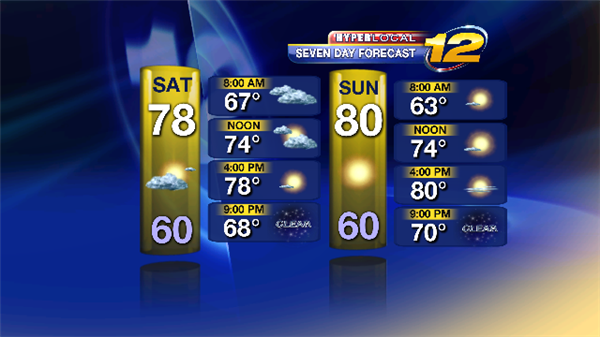 Forecast on Saturday - Sun and Clouds to Mostly Sunny. Breezy. Dangerous Rip Currents possible. Less humid. Highs in the upper 70s to low 80s. 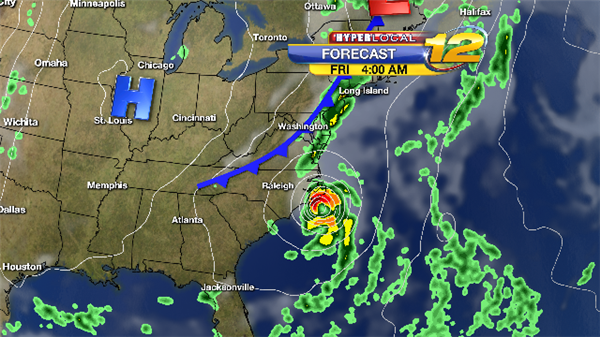 High pressure - Big Blue H on weather map will bring dry and Sunny weather Saturday afternoon and Sunday. 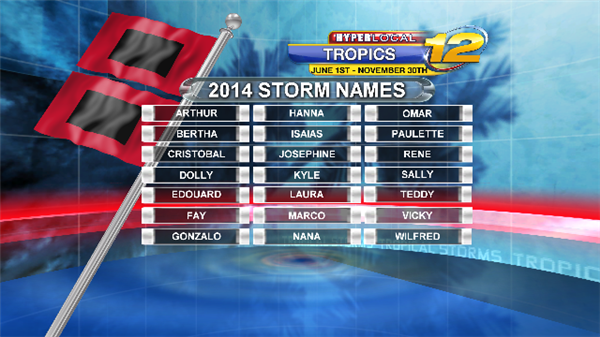 Storms are given names when wind speeds are sustained at 39 mph or greater. Here are weather images from our RPM Model: You can track the rain and see the heaviest rain will be late Thursday into Friday. 1 to 3 inches possible. South Shore, Rip Currents, Rough Seas waves 5 to 10 feet. 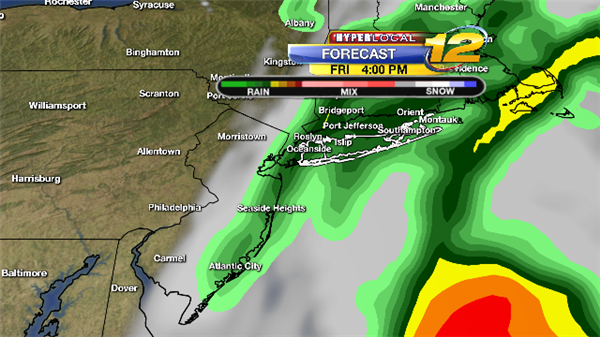 Drier weather coming over Long Island Friday night and we will see a beautiful weather. 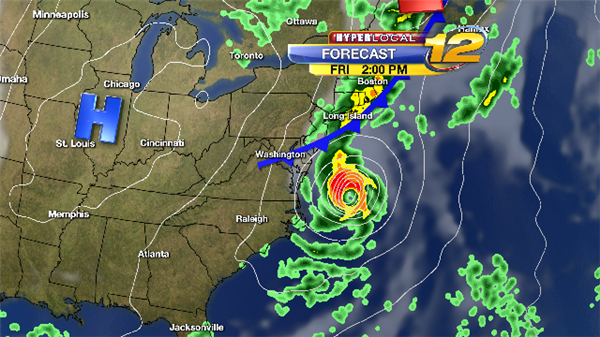 TRACKING ARTHUR: The Cold Front (blue line) will bring showers and thunderstorms Thursday night into Friday. 1 to 3 inches of rain is possible with localized flooding. As you look at the maps below you can see the cold front will move east of Long Island by Friday afternoon and that will help kick Arthur out to sea. Rip Currents and Rough Seas. Gusty winds south shore and east end. 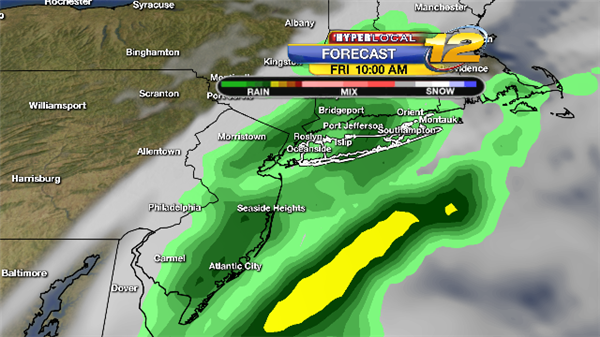 Rain showers will taper off west to east Friday afternoon. Be prepared for the wet weather if you had outdoors plans. 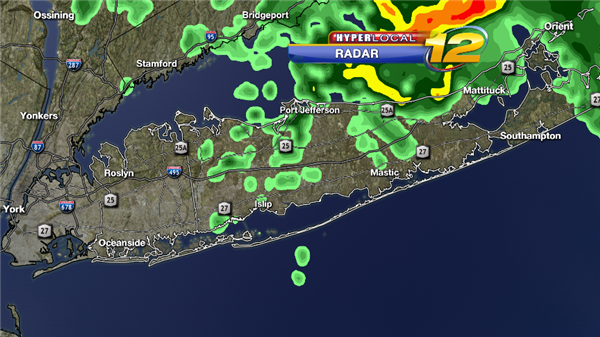 Skies will dry out in Nassau County towards 8pm and the East End by Midnight. It will be a close call for fire works. 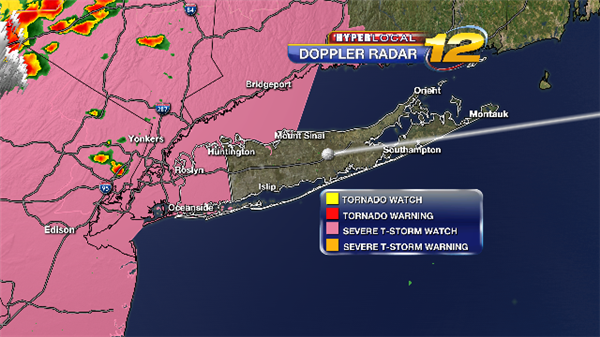 A severe thunderstorm warning is in effect for Nassau County and Western Long Island Sound through 9PM. Watch for pop-up storms mainly after 5PM. Any storms could bring heavy rain, gusty winds, and frequent lightning. It's hto and humid again today with some sunshine during the afternoon. 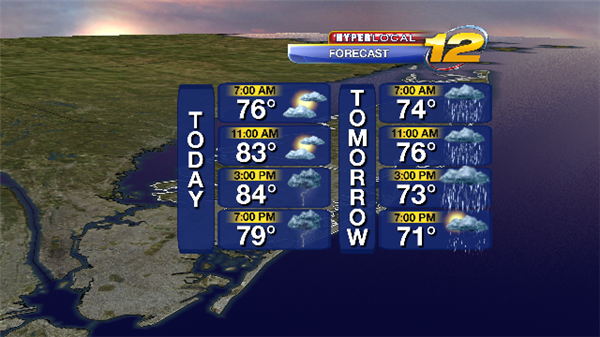 Watch for late day showers and storms. 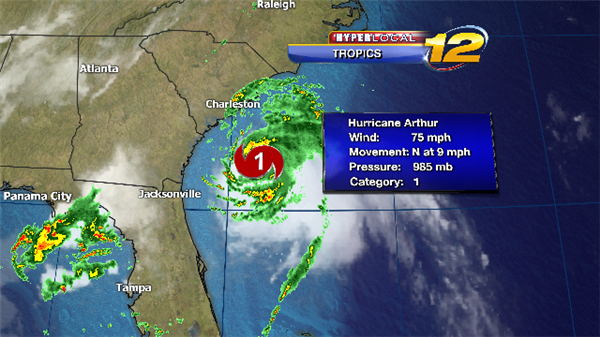 Hurricane Arthur passes southeast of Long Island tomorrow bringing periods of heavy rain and rough conditions on the water. Skies will begin to clear from west to east late in the evening. 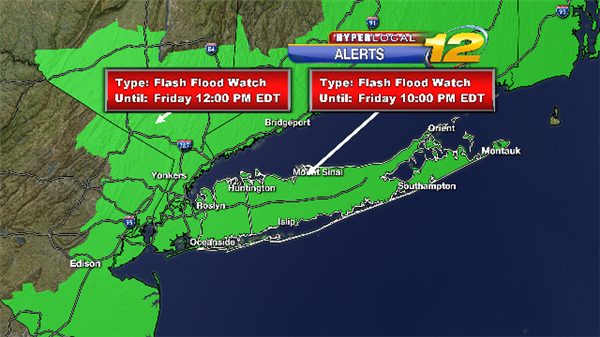 A flash flood watch is in effect for Long Island through this evening. Topical showers and storms could bring heavy downpours at any point through the afternoon leading to localized flooding on area roads. Rain ends this evening. 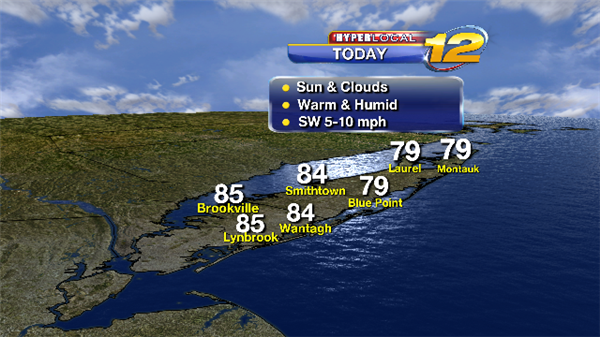 Warm and humid today with highs near 85 degrees. 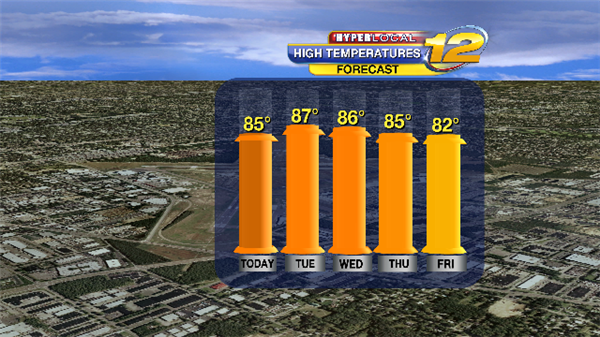 Tuesday and Wednesday will be the hottest days this week with highs in the upper 80's to near 90. Extra clouds this morning give way to increasing sunshine. Southwest winds pick up later today keeping the South Shore a little bit cooler. 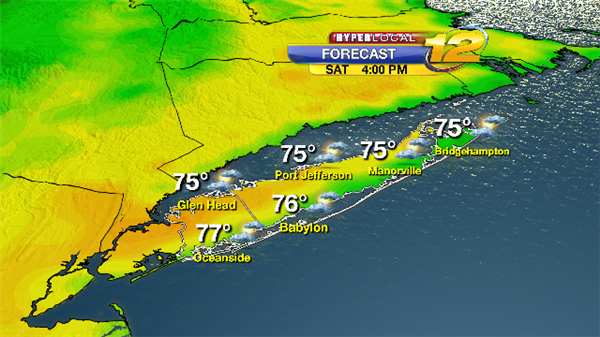 Best beach weather will be through thi searly afternoon. Southwest winds pick up late bringing choppy conditions on the water. Watch out for rip currents and swim in front of the lifeguards. The water is getting a little bit warmer from this weekend with temps in the upper 60's. Today's hot spots will be on the North Shore with temperatures topping out near 90 degrees! It will be a good 10 degrees cooler along South Shore beaches and the East End with a breeze out of the southwest. Watch for thunderstorms this afternoon into this evening. Some storms could become strong to severe. The main threat with stoms will be gusty winds, heavy rain leading to local street flooding, and frequent lightning. Temperatures continue to run a touch cooler than normal but it feels great outside with sunshine and low humidity. 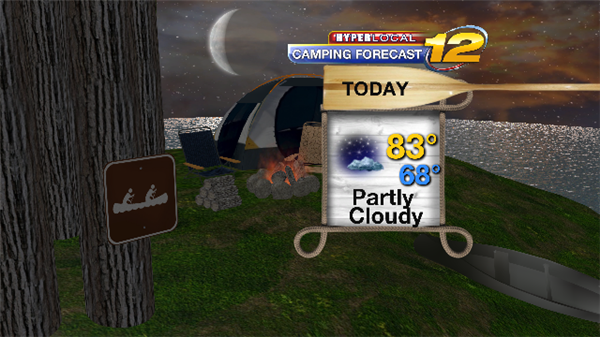 Great camping weather with warm and dry conditions. 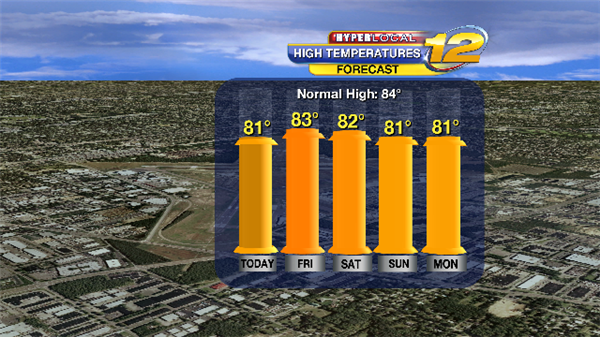 Highs today will be in the low 80's. It will also be a little bit warmer at night with lows in the upper 60's. If you want to play by the water there no advisories. Enjoy! 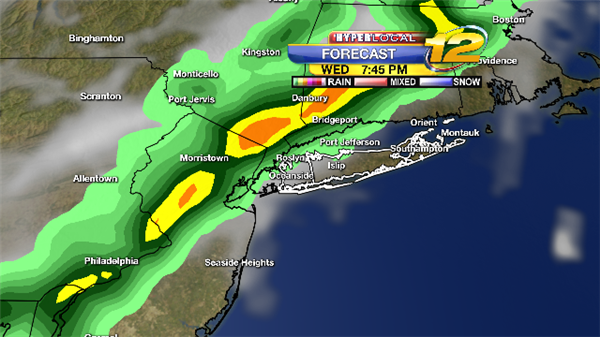 The next chance of rain comes tomorrow evening after 7PM. It will be very warm and humid so any storms could bring heavy downpours and gusty winds. 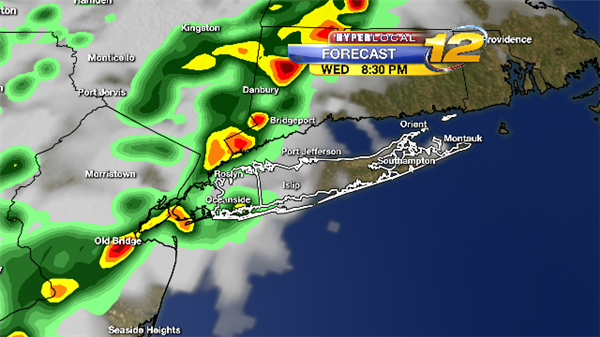 Watch for showers and storms after 7PM. 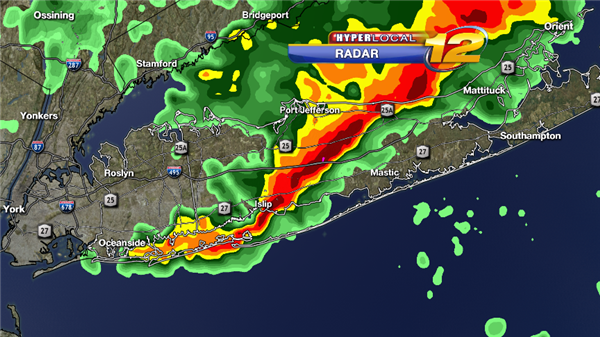 Storms could bring heavy downpours and gusty winds. 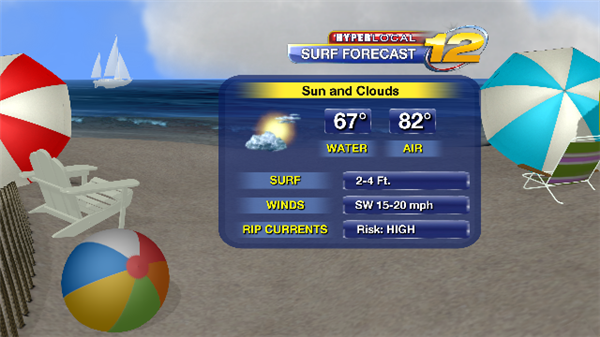 Saturday is the better day for water activities with lots of sunshine and just a few clouds. 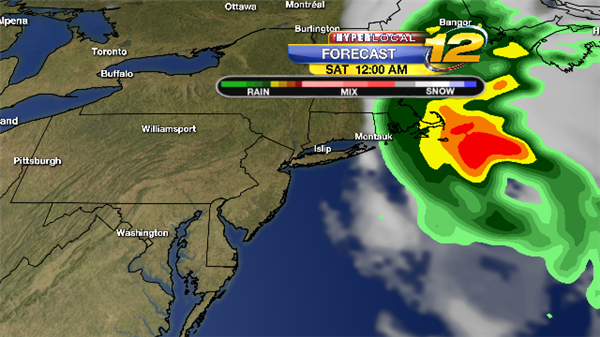 There's a chance of showers and maybe a storm late Saturday night into Sunday. 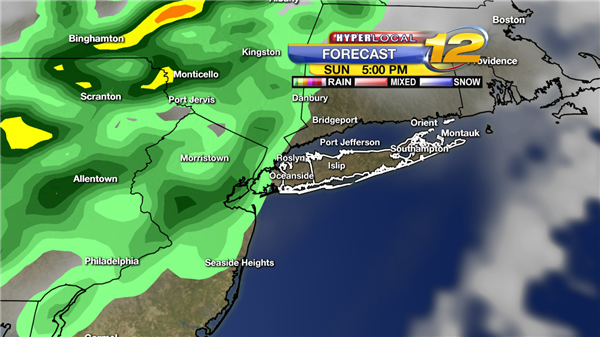 It becomes partly sunny Sunday afternoon with another chance of showers late in the day. Most of the weekend will be dry. 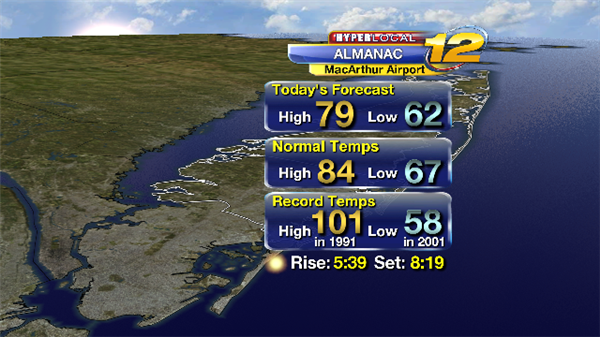 A cooler than average day with really low humidity for this time of year. 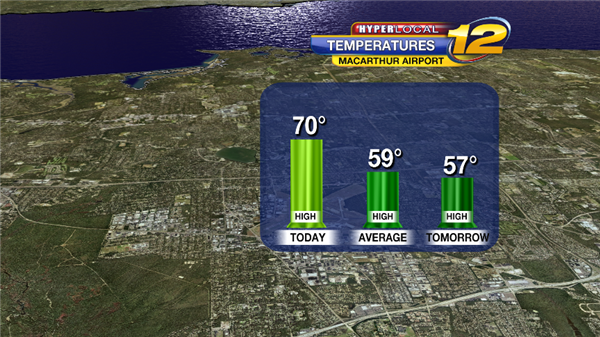 Islip Airport made it to 80 degrees but most of us were stuck in the 70's. Temperatures are a tad warmer for Wednesday with highs near 82. A cool night coming up again. 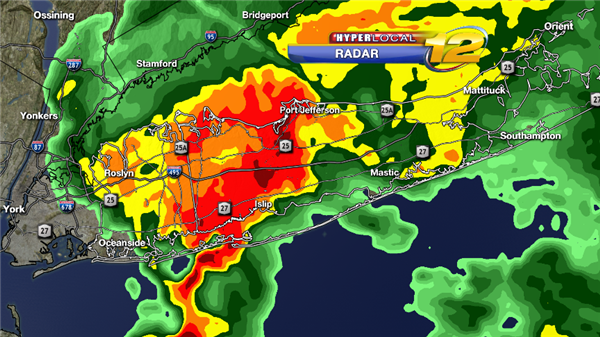 Look at Westhampton! As of 10:30PM the temperature is down to 58 degrees. Another great day comign up tomorrow. Lots of sunshine with a few fair day clouds during the afternoon. 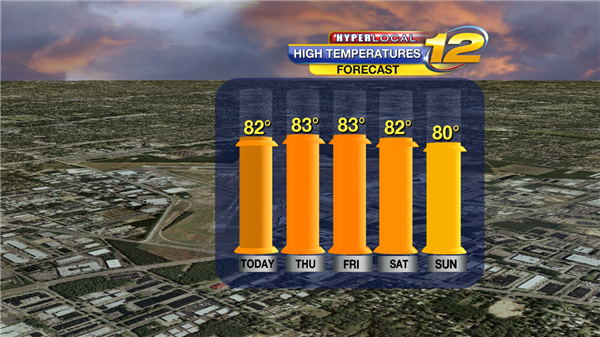 Highs will be near 80 degrees with low humidity. 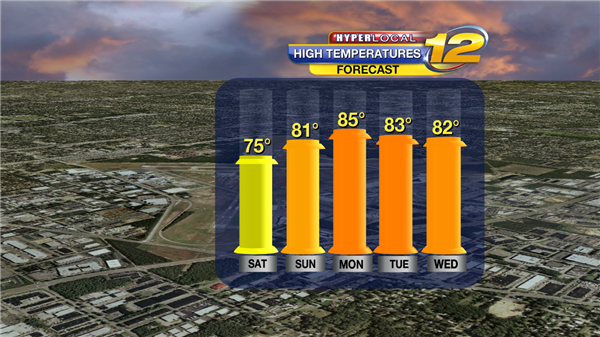 Nice summer temperatures follow us into the weekend with lower humidity! Highs will be in the low 80's. Still no sign of 90 degree heat on the way. 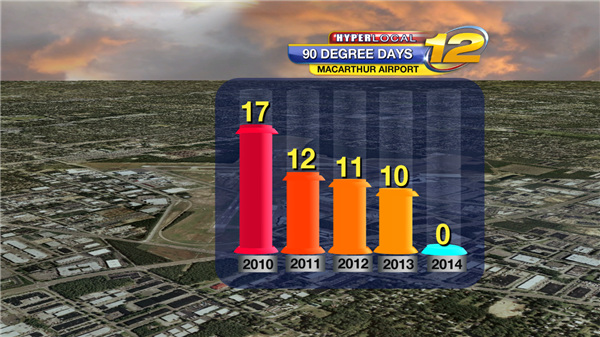 We haven't even had one 90 degree day at Islip Airport so far this summer! The last 90 degree day was on July 20th, 2013. 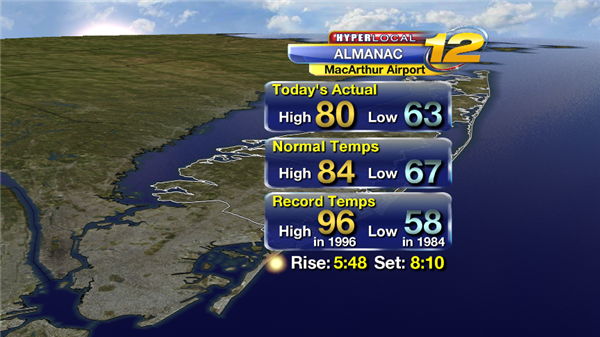 The hottest day so far this summer was June 18th when the airport reached 89 degrees. Have fun summer plans this evening? There's the slight chance of a shower or thunderstorm after 5pm. Most of you will stay dry... keep an eye on the radar. Pictures from 430am through 930am, (every half hour) You can see why we had flooding with all the heavy rain. 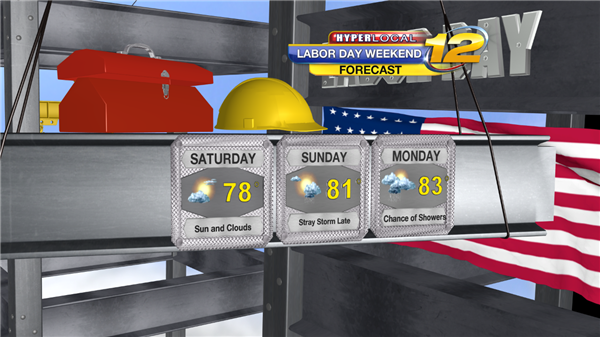 Our weather will be dry for most of the holiday weekend. The next chance of showers will come late Sunday towards the evening with most of the showers holding off until Sunday night. SATURDAY: Partly to mostly sunny and nice with highs near 78 degrees. Turning a little bit more humid late. South southeast wind 5 to 15 mph. SUNDAY: Warm and humid with a mix of sun and clouds. 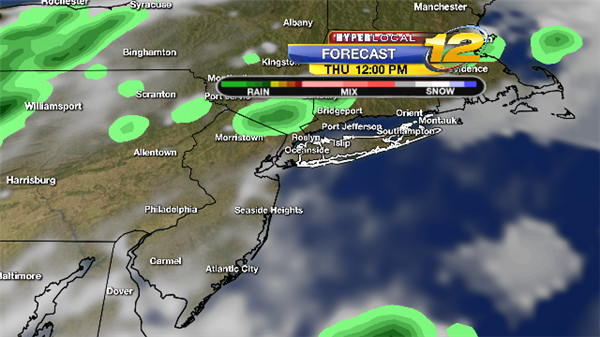 Small chance of a late day shower or storm, mainly by the evening. Most of the day is nice and dry. Highs near 81. Lows near 68. MONDAY: Labor Day. Partly sunny, warm, and humid. Chance of showers and thunderstorms. More dry time than wet time. Highs near 83. Lows near 68. UPDATE WEDNESDAY 7AM 9-24: Changing weather conditions the next 48 hours. 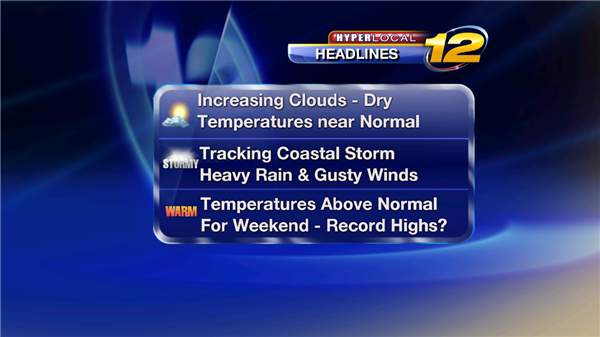 Dry today, but clouds on the increase as the News12 Weather Team tracks a Coastal Storm heading towards Long Island. TODAY: Sunrise: 6:42am, Sunset 6:47pm. Morning sunshine giving way to afternoon clouds. Breezy. Winds East-Northeast 10 to 15 mph. Highs 65 to 70. TONIGHT: Cloudy with rain developing after Midnight. Winds East-Northeast 15 to 25 gusts near 30 mph. Lows near 58. TOMORROW: Cloudy skies with periods of rain. Some rain will be heavy at times and could cause flooding. Windy. East-Northeast winds 15 to 25 Gusts to 35 mph. Highs near 67. Overnight will be cloudy with scattered showers. Some pockets of moderate rain possible. Lows 55 to 60. 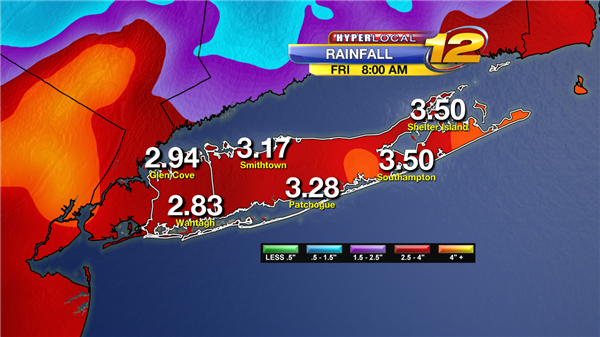 Rain totals 1 to 3 inches with some higher amounts. MARINE FORECAST THURSDAY INTO FRIDAY: Minor coastal flooding with tides running about 1 foot above normal during high tides. 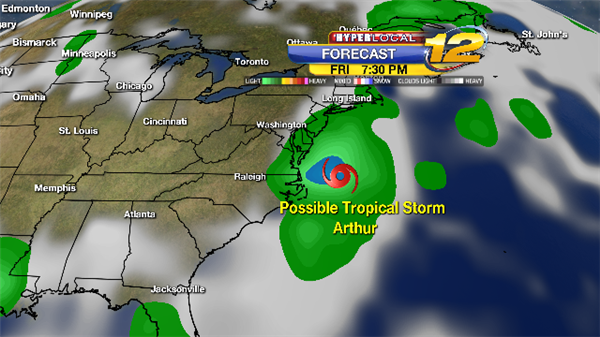 Beach Erosion possible with waves 4 to 8 feet and strong East to Northeast winds 25 to 35 mph. Be Alert if you live along the coastlines. 3pm Thursday: Periods of rain, some heavy at times. Gusty winds East-Northeast 15-25 gust 30-35 mph. Temperatures 64 to 68. 7pm Thursday: Cloudy skies with scattered showers, still a threat of Moderate Rain. Gusty winds with temperatures in the low 60s. In the Bronx at 7pm: expect showers for the last yankee home game of 2014. We could have some delays for the game. 20% chance game could be cancelled. 10am Friday: Mostly cloudy skies with some scattered showers possible. Temperatures in the lower 60s. 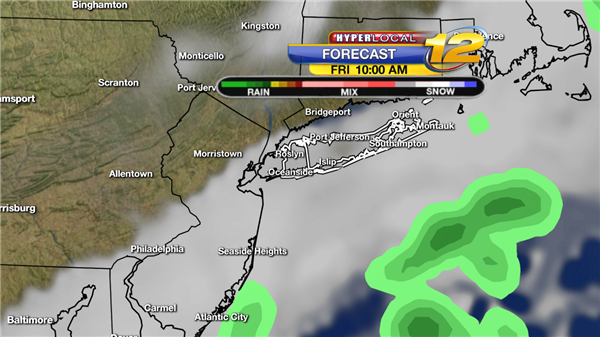 FRIDAY: Mostly Cloudy skies with a few spotty showers mainly in the morning. Breaks of sunshine through the afternoon with a chance of showers. . Breezy. Highs 68-73. Overnight partly cloudy skies. Lows 55 to 60. 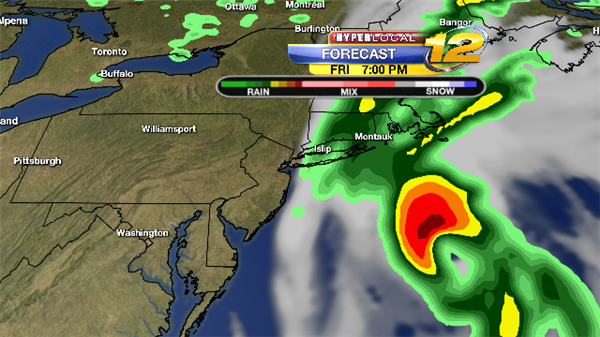 Here is one computer Model ( RPM from WSI) that shows 2 to almost 4 inches of rain from Thursday into Friday. 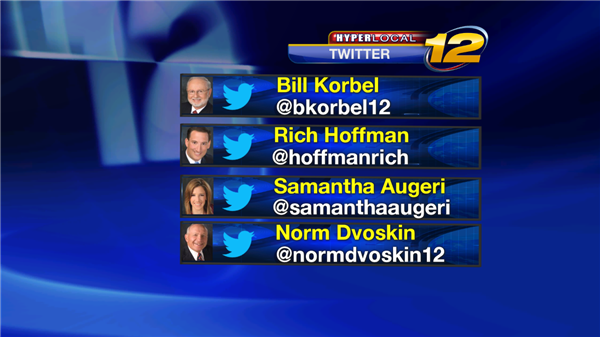 Don't forget you can Tweet the News12 Weather team with weather reports from your neighborhood. You can also post photos, videos and weather conditions on my facebook page: https://www.facebook.com/#!/News12MeteorologistRichHoffmanSATURDAY: Mostly Sunny skies. Warm. Highs 72 to 77. Overnight will be mostly clear. Some patchy fog. Lows near 58. The below map shows the Red L - low pressure(bad weather) moving away from Long Island and the Blue H - High Pressure (good weather) moving closer to Long Island. High pressure will lead to sunshine and drier weather. SUNDAY: Mostly sunny and warm. Record high possible. Highs 75 to 80. Record high is 78 set in 2007. 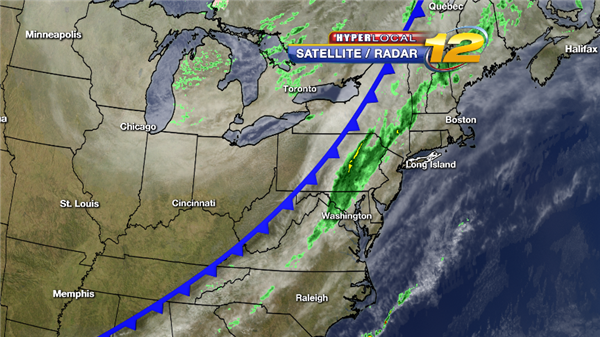 Tracking a weak cold front from the North which will impact LI overnight. Clouds will build and winds will shift to off the water. Chance for drizzle and some fog. 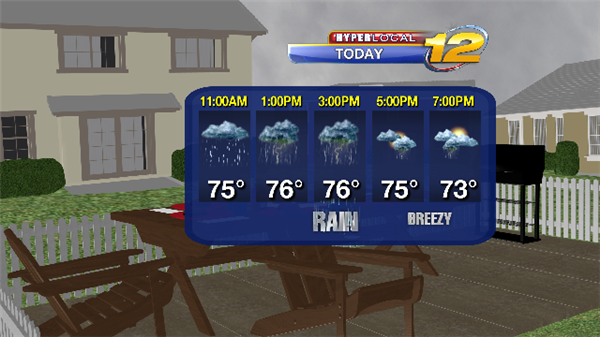 with spotty showers, drizzle and fog. Lows near 58. In the map below you can see weak area of low pressure. 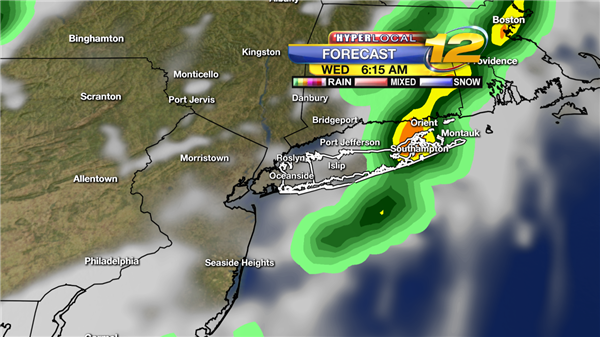 The lift from the weather feature will give LI a threat of showers into Wednesday. showers. Highs 65-70. Overnight will be mostly cloudy. Lows near 56. The weather map below shows a strong cold front on Saturday which will bring wet weather and cooler temperatures for Sunday. A series of disturbances rotating around a low pressure system up in Canada will bring unsettled weather for the next 36 hours. 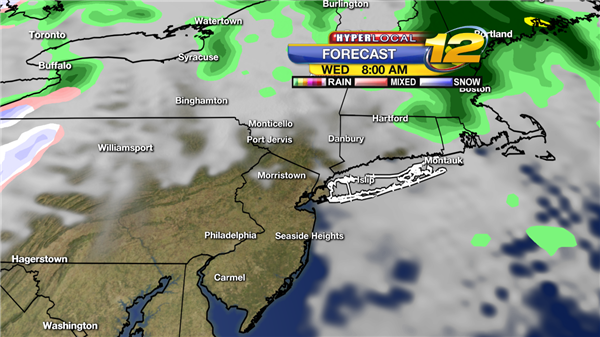 Clouds thicken up overnight tonight with the slight chance of sprinkles or light rain showers by tomorrow morning. Sunshine quickly returns late morning with mild temperatures and dry conditions for the afternoon. 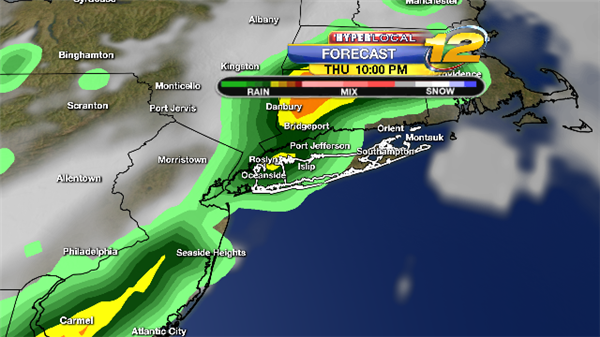 By Tuesday evening another disturbance approaches bringing the return chance of showers and possibly and thunderstorm. Brief heavy downpours can't be ruled out since humidity will be high with the wind off the water. Showers will continue overnight Tuesday into Wednesday morning. A cold front then clears Long Island after sunrise with clearing skies from west to east and sunshine by Wednesday afternoon. Fingers crossed for clear skies by sunrise so the Total Lunar Eclipse will be visible. Total eclipse begins at 6:25 AM. 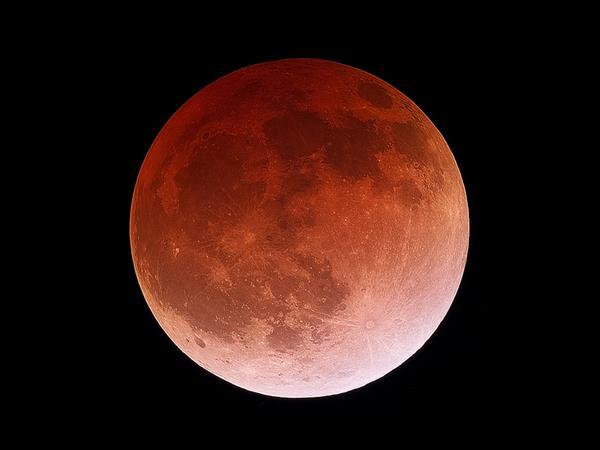 The Moon will have a red - orange tint as the sun and moon are exactly 180 degrees apart in perfect alignment. 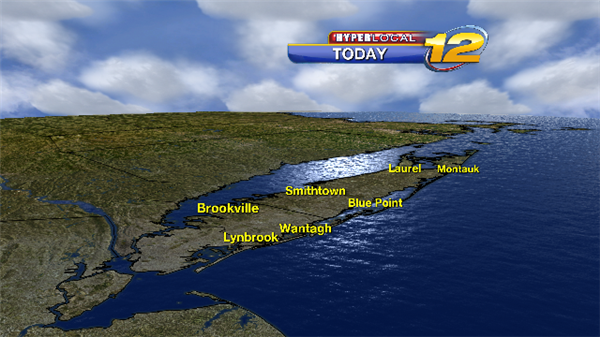 It's another warm day across Long Island with temperatures near 70 degrees! That's at least 10 degrees above normal. Colder changes are on the way once a cold front passes by tonight. Then we'll get back to more typical fall-like weather. 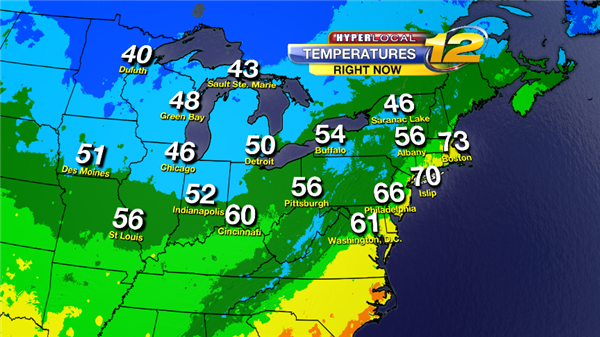 Along the East Coast temperatures are more spring-like with highs in the 70's. 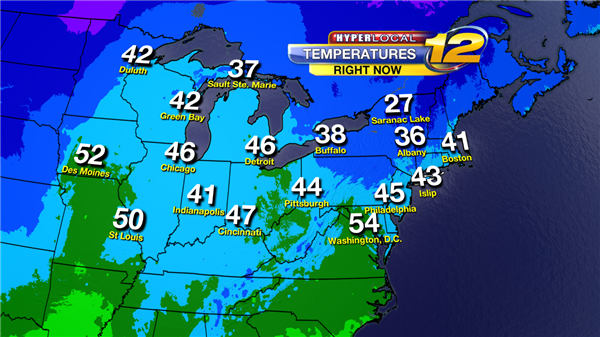 To the west, especially through the Great Lakes there's a fall chill with highs only near 50. That colder air will be reaching us by the weekend. 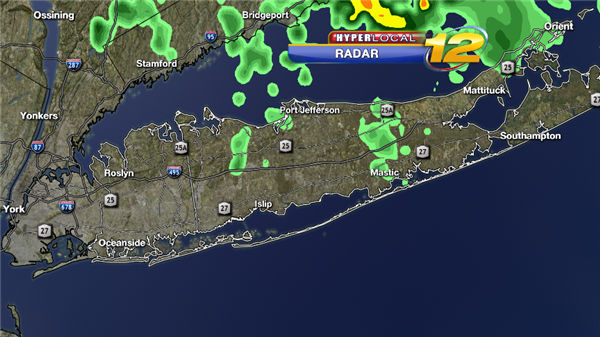 There's a few rain showers along with a cold front just west of Long Island. 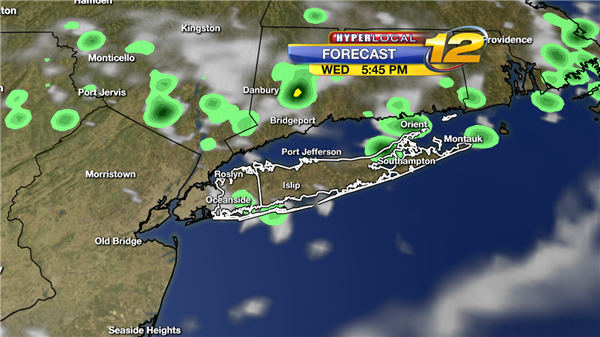 One or two of those showers may reach you between 5 and 10 PM from west to east. After that, drier and colder weather will build in along with clearing skies by morning. The average high for today is 59 degrees. Tomorrow will feel cool to chilly after our brief warm-up but temperatures will actually be seasonable or "normal" with highs in the upper 50's to near 60. It will also be nice and sunny with a few fair day clouds during the afternoon. 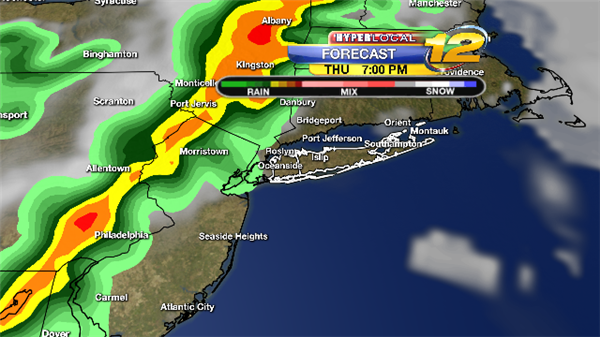 Tracking a storm for Thursday which will bring moderate to some heavy rain. Look for rain developing in the morning and will be on and off through the day. Highs 58 to 63. .50" to 1.25 inches of rain. Some gusty winds possible with gusts around 30 mph. 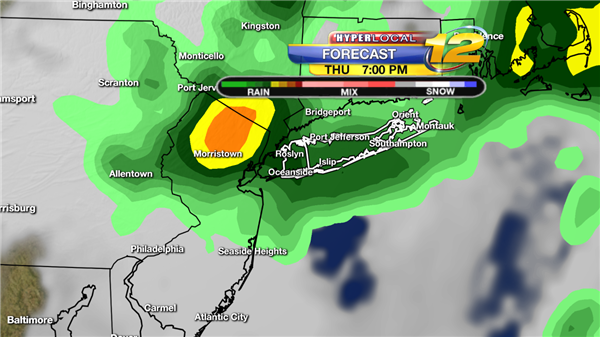 Some moderate to heavy rain Thursday evening with temperatures in the 50s. Yellow and orange on the maps shows the heaviest areas of rain. On Friday skies will start to clear west to east through the day. Morning clouds and showers going to partly sunny skies. Highs 52 to 57. Weather for Saturday Looks good with mostly sunny skies and highs 47 to 52. 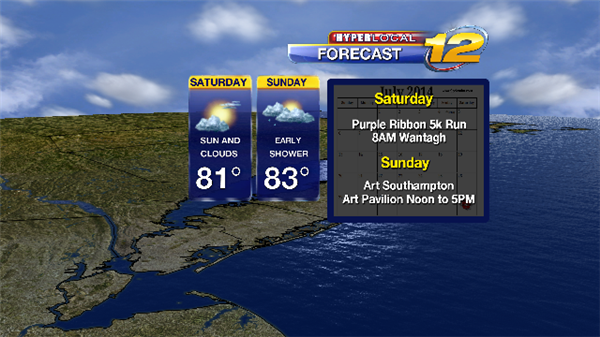 Increasing Clouds on Sunday with scattered showers. Highs 50 to 55. 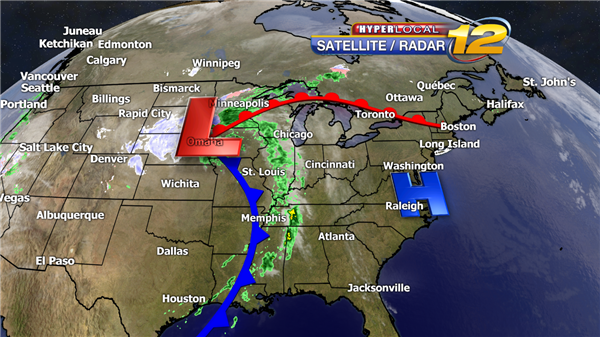 Tracking the Red "L"s on the weather map - L = Low pressure and are areas of clouds and rain. The above weather map is for Sunday morning at 7am. 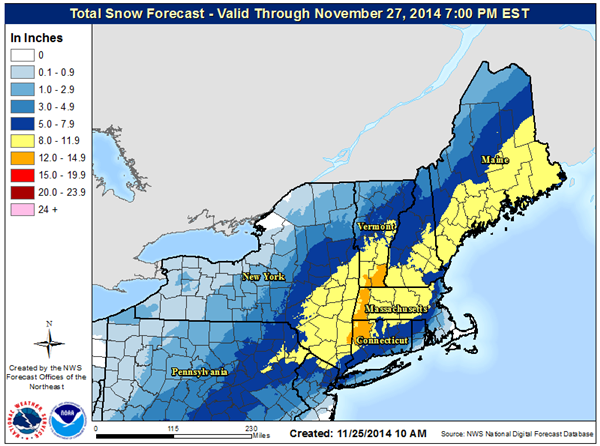 FORECAST UPDATE AT 6PM ON SUNDAY NOVEMBER 16TH 2014 BY METEOROLOGIST RICH HOFFMAN. A little change in the weather the next 24 to 36 hours with WARM, WET and Windy before the Coldest Air Mass of the season hits Long Island. Rain developing overnight towards Monday Morning. Lows 35 to 40. On Monday, two areas of Low Pressure will bring Warm Air, Periods of Moderate to heavy rain and strong gusty winds. 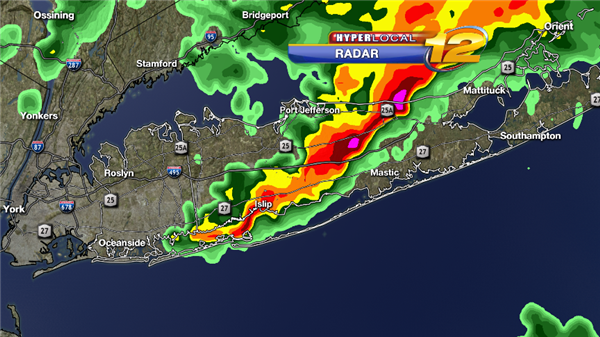 As the storms get closer warm, unstable air will impact Long Island. 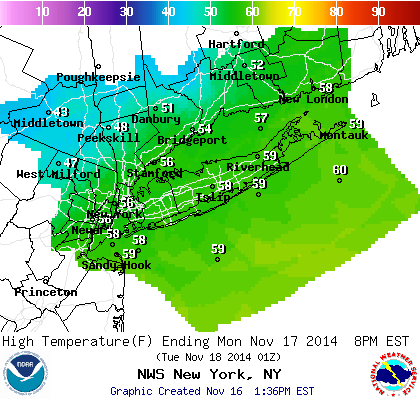 Temperatures rise up to almost 60 degrees and thunderstorms are possible. Winds will be sustained 10 to 20 with some gusts 30 to 40 mph. Storm total for rain .75 to 1.75". The below map showers the weather conditions at 7am Monday. 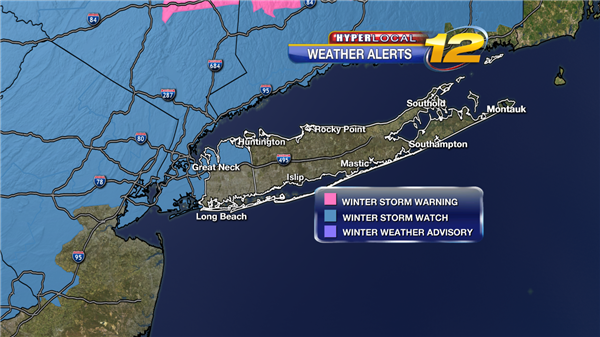 Wintry weather will be north and west of Long Island. 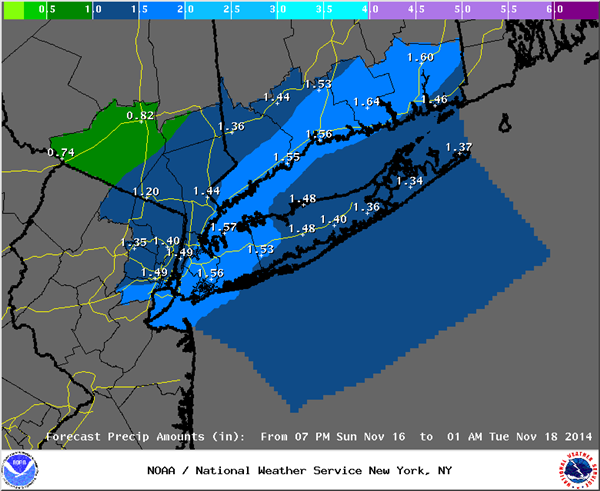 Below map is storm totals for Precipitation for Sunday into Tuesday. 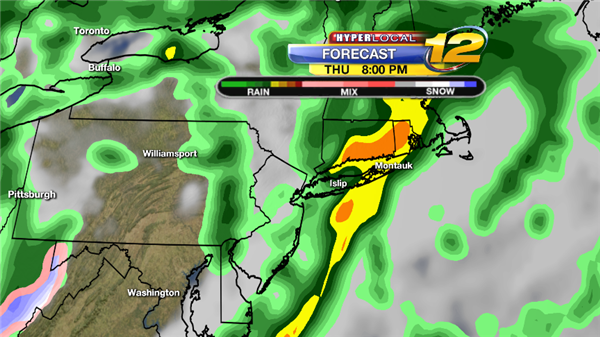 Monday Night expect cloudy skies with rain taper off to showers and ending early Tuesday Morning. Small chance that some rain showers end as snow showers. It will be windy and cold. Winds West- Northwest 15 to 25 some gusts near 40 mph. 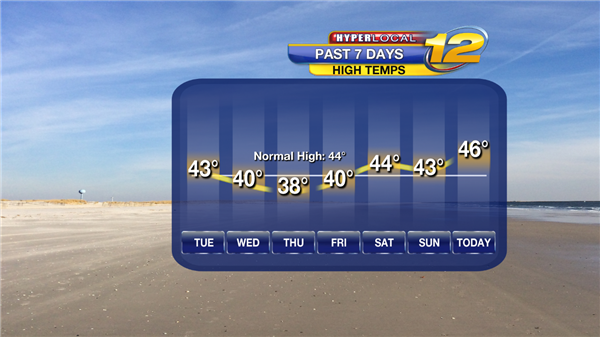 Temperatures 35 to 40, wind chills 20 to 25. Tuesday will feature sun and clouds and it will be very cold. 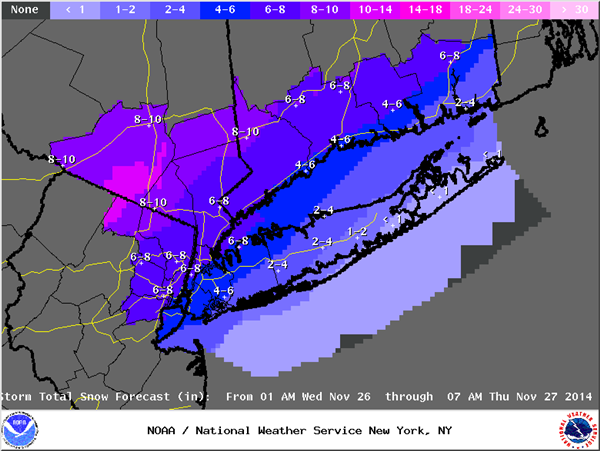 A blast of Arctic cold air will move over Long Island. Winds West- Northwest 15 to 25 some gusts near 40 mph. Temperatures will be in the 30s, wind chills in the 20s. We could have some rain and snow showers. Tuesday night will be partly cloudy, breezy and very cold. Lows 20 to 30, wind chills between 10 and 15 degrees. Record low for Wednesday November 19th is 23 degrees set in 1997. We could break this record. Wednesday will be sunny and very cold. Highs 35 to 40, Normal High 53. Overall we stay cold through at least November 24th. Models showing a warm up towards Thanksgiving. 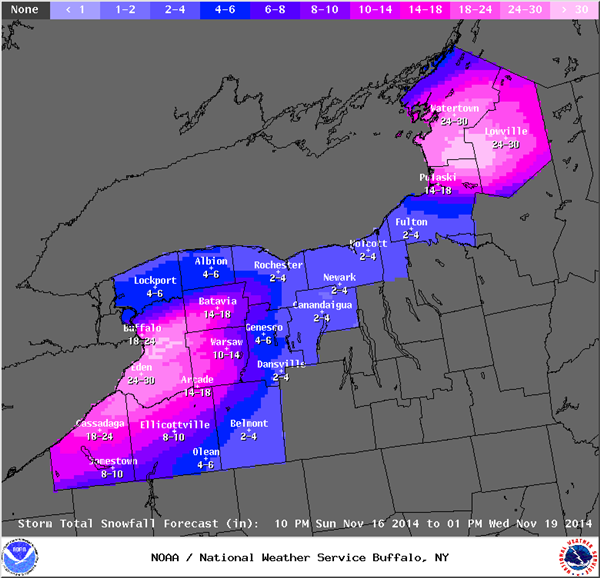 BTW IF YOU WANT SNOW: LAKE EFFECT SNOW WILL PRODUCE 1 TO 3 FEET IN THE NEXT 48 HOURS. below is weather map for Monday night at 7pm. Winter Storm Watches posted from 7am Wednesday to 7am Thursday. 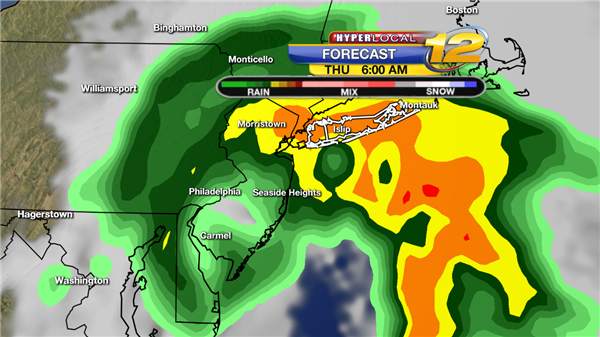 So what to expect: rain developing between 6am and 8am: Some of the rain will be heavy at times. Temperatures 38 to 41. Wet Morning Commute. 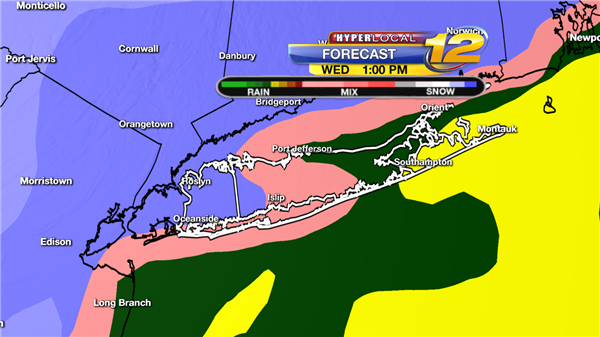 On the above weather map - Blue= Snow, Pink=Rain/snow Mix, Green= Rain, Yellow=Heavy Rain. During the Mid day expect a rain and snow mix. 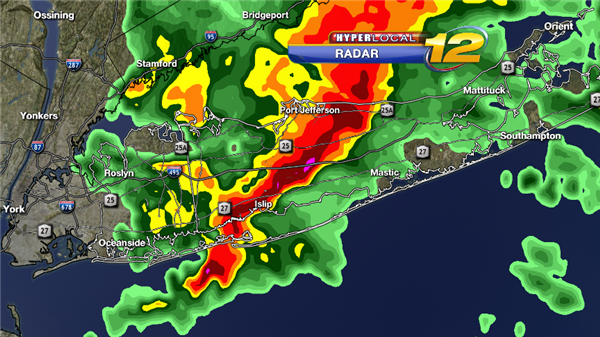 Some snow in Northern Nassau county could be heavy at times. 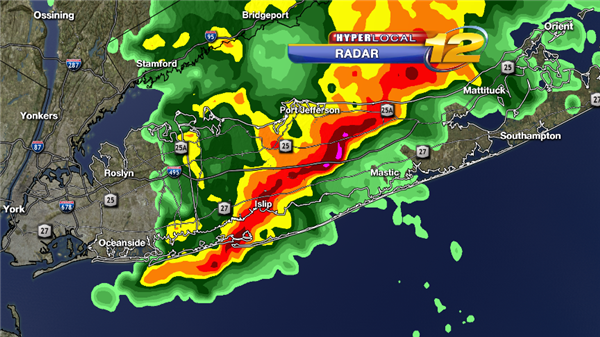 Moderate to heavy rain over the east end. Temperatures 34 to 40. 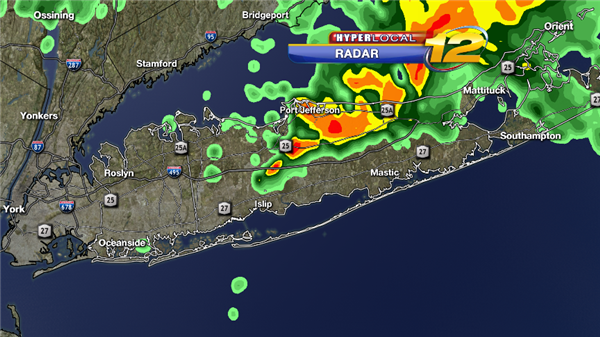 Wet and sloppy road conditions, some localized street Flooding. 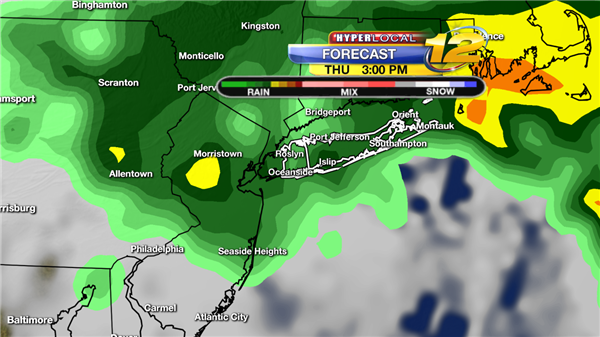 For the evening rush, we will have a mix of rain and snow. Here is the problem, does the snow change back to rain. (The above image is one computer model.) 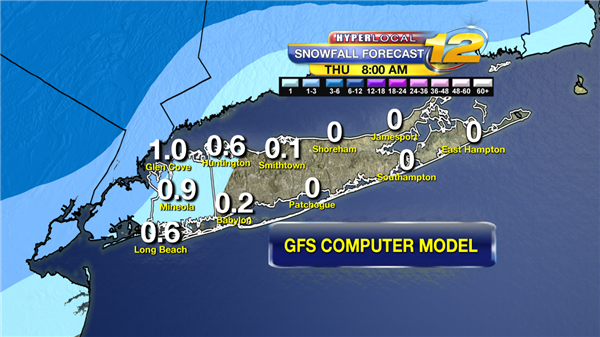 If that happens snow totals will be under 1 inch for most of Long Island. 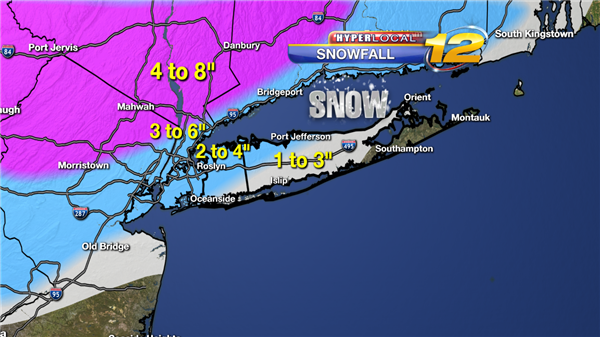 If the snow, stays snow there could be several inches of snow on the ground with icy roads for evening commute. Expect flight delays. Temperatures 34 to 37. 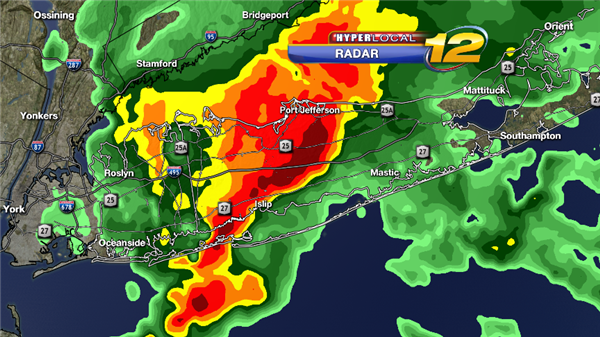 Wet and sloppy road conditions, some localized street Flooding. Rain and snow mix at 9pm. 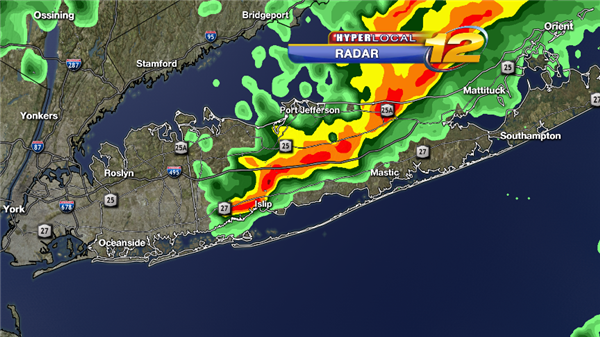 You can see again most of Suffolk is seeing rain with a wintry mix in Western Nassau county. If you noticed in the above maps, areas just north of Long island, like 10 miles, they stay all snow and will see 4 to 8 inches of snow. This is something we have to watch very closely. We will fine tune the snow fall amounts tonight and into tomorrow. We need to watch for ICY roads Overnight into Thursday morning. Temperatures will be near 32 degrees. 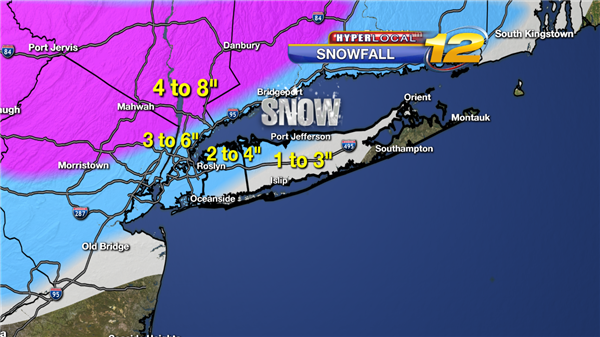 As of now, 730am on Tuesday, this is what I am thinking for snowfall. 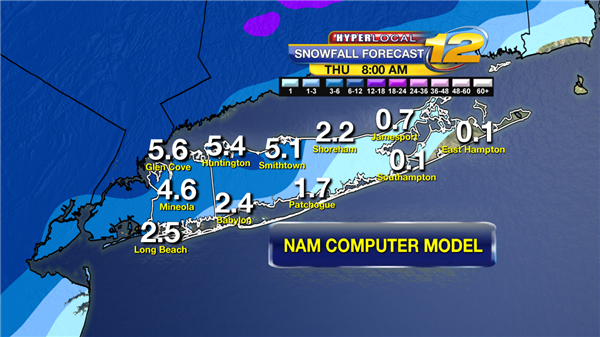 highest amounts in Northwestern Nassau County to Little snow in Montauk. Be Alert and Be Prepared for changing weather conditions. 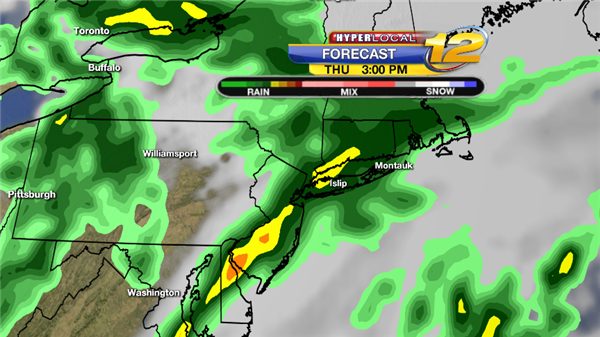 THURSDAY--HAPPY THANKSGIVING: Rain or snow shower in the morning. Icy roads. Use caution traveling in the morning. Mostly cloudy skies during the day with a chance of a shower. Highs near 42. NYC Parade Forecast: 9am to Noon: Mostly Cloudy skies, Cold with temperatures 35 to 40. Overnight will be partly to mostly cloudy skies with lows near 27. 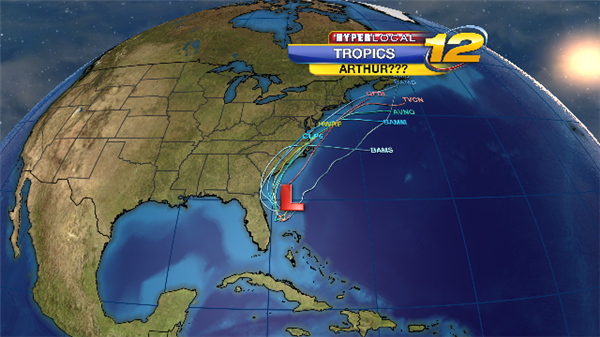 At News12 our Meteorologist use different forecast models for guidance. Some models are better than others. Some parts of each model are better than other parts. 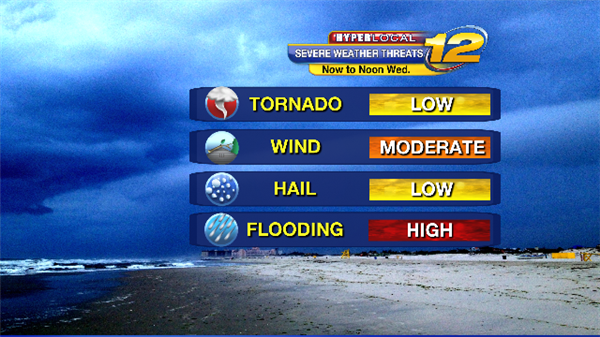 The four main models we use at News12. 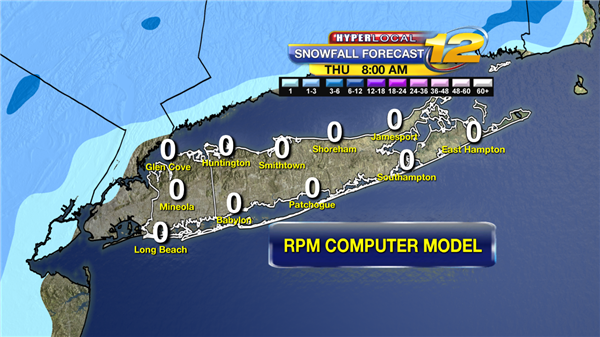 As you can see the models can not agree on how much snow. It's our job as Meteorologists to go over the data and trying and figure out which parts of each model are correct. Then we make our forecast. As of right now, below is my snowfall forecast. Updated by Samantha Augeri on Monday, December 15th. A picture perfect start to the work week with temperatures in the mid 40's! A warm front associated with low pressure will approach Tuesday afternoon brining warmer temperatures, increasing clouds, and the chance of showers. Most of the day will be dry with highs nearing 50 degrees. 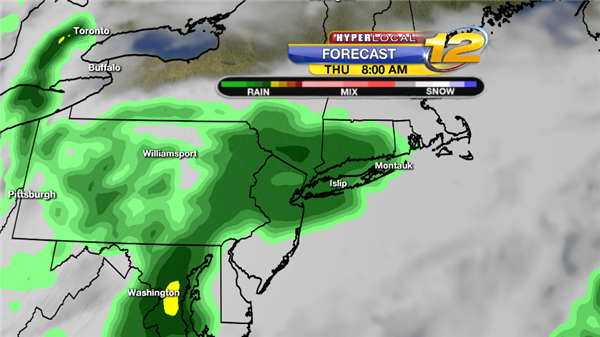 Light rain showers will pass by Tuesday night with a cold front... and those showers will end by Wednesday morning. Sunshine returns to finish off the week with cooler temperatures. 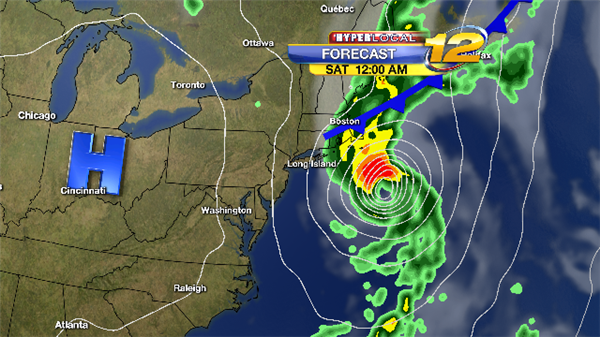 THEN, we're tracking a more significant storm that will take a track south of Long Island on Sunday. We could see a wintry mix followed by rain and wind.... stay tuned.